No one should've been surprised that numerous players were dropped for the midweek fixtures. As the schedule picks up, it only makes sense that players get rested after playing 180 minutes in the matter of a few days. 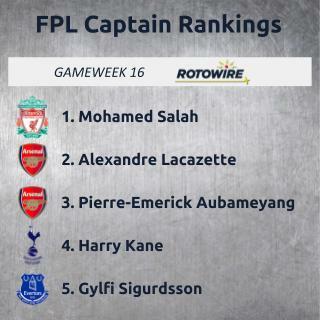 That being the case, fantasy bosses can be a little more confident for the upcoming gameweek in giving the armband to players like Mohamed Salah, who didn't start Wednesday. The question is how to rate someone like Christian Eriksen, who is coming off back-to-back starts, versus Salah and others. It doesn't help that Chelsea host Manchester City, likely taking away Eden Hazard as a top option, but also everyone on City. Sure, Raheem Sterling should be back in the starting XI, but that doesn't mean it's a good idea to captain him considering there have been a total of four goals in the last three meetings between the clubs. There are still a few good matchups, even if picking a captain isn't the easiest thing. Arsenal (v. Huddersfield) and Manchester United (v. Fulham) are both at home against teams battling relegation. I'm more inclined to trust the Gunners since they've been a much higher-scoring team, averaging more than two goals per match. Pierre-Emerick Aubameyang is the logical place to turn, but I think there's a decent chance he gets dropped for Alexandre Lacazette, who didn't start the past two games. It still can't be forgotten that Lacazette is averaging just as many shots and chances created per 90 minutes as Aubameyang, so he's far from a bad option. There isn't one player to feel comfortable about on United, though Anthony Martial scored again Wednesday, giving him seven goals in his last seven league starts. It's hard to deny what he's done when in the lineup, whereas Romelu Lukaku is a mystery every week. Both Arsenal and Man United could be set for clean sheets, but I'm not interested in giving the armband to any of their defenders. Liverpool should be close to full strength for their trip to Bournemouth, and there should be goals between them, with an average of three per match being scored whenever the Cherries are at home. I'm passing on Callum Wilson this week, though he's been one of the most consistent fantasy players this season with eight goals and five assists. Salah upset everyone in the midweek, but he should be ready for this trip and he'll be captained by plenty as Bournemouth have allowed 95 shots and 64 chances in the last five gameweeks. Roberto Firmino should be under consideration next, as I'm not sold on Sadio Mane being healthy. Tottenham's trip to Leicester has all the makings of a let-down from Harry Kane, so be wary of the matchup. Leicester tested their luck at Fulham with a few different players, but they've been stout at home, allowing just one goal in their last four in all competitions. Kane will surely get chances, but scoring will be more difficult than expected, especially if Eriksen misses out. Since returning from injury in late October, Wednesday's match was the first time Eriksen had started back-to-back games. If you want to go full differential, Johann Berg Gudmundsson is home against Brighton, who have been hard to predict, winning their last two, but it was only a few weeks ago that they lost at Cardiff. Either way, Gudmundsson will be on the ball plenty and should get a few opportunities up front (though I'm not saying that I'd captain him). If Marko Arnautovic didn't pull his hamstring, I'd be keener on West Ham, but I'll pass on Felipe Anderson and Robert Snodgrass until they show a little more. Newcastle hosting Wolves is another tricky matchup since both clubs have looked good and equally bad at times. The best place to turn for the smaller clubs has to be Everton at home against Watford, who have one point from their last five matches. As usual, Gylfi Sigurdsson is the safest play because he's on so many set pieces, but Richarlison can't be ignored after he had five more shots and a goal last match.